Few experiences on Earth compare to feeling a bass pump deep in your spine or seeing an opera star climb an aria’s melodic scale with passion and persuasion. The thrill of live entertainment is not only a mainstay of human culture, it’s a healthy revenue source in today’s music industry. Recorded music sales have dwindled by 50 percent in the last ten years, but concert ticket revenue has exploded in the same period of time. The Arts Presenting and Live Entertainment Management Program at the Frost School of Music (“AP Live”) offers a curriculum that’s distinctly tailored to live entertainment. Our marketing, promotion, legal, and finance classes focus on for-profit as well nonprofit management, with an emphasis on the performing arts and commercial music industries. Beyond an innovative classroom curriculum, and an online degree offering, Frost Arts Presenting students also receive extensive in-the-field experience. A capstone element is the Arts Presenting Project, which places students in the driver’s seat on production and marketing of signature events. These events often feature the premiere of new works and include rewarding collaborations with entertainment legends such as Phil Ramone and Bruce Hornsby. 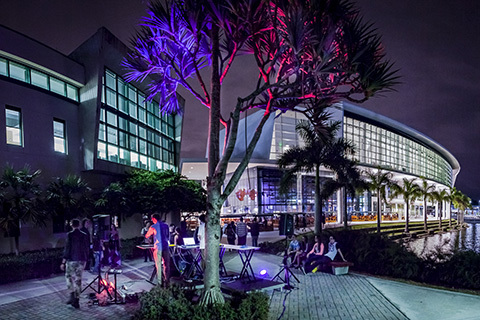 Many of our students also explore extracurricular projects, such as bringing international artists to Miami venues and creating fundraising concerts for important causes. Click here to view a description of the projects Arts Presenting students have managed. Through relationships with several performing arts venues and live entertainment organizations, the Frost School enables Arts Presenting students to complete an internship during their fourth semester. Our students have interned at the Broward Center for the Performing Arts, Miami Symphony Orchestra, AEG Live, and more. South Florida is a dynamic multicultural region with a robust community of arts patrons. It is the perfect environment in which to study what it takes to produce and present successful live events. Our students also gain hands-on experience with campus-based events at venues such as the BankUnited Center, the Fieldhouse, Gusman Hall, and Clarke Recital Hall. They also assist with the production of Festival Miami, an annual festival that opens the South Florida arts season with a full month of superior musical programming.